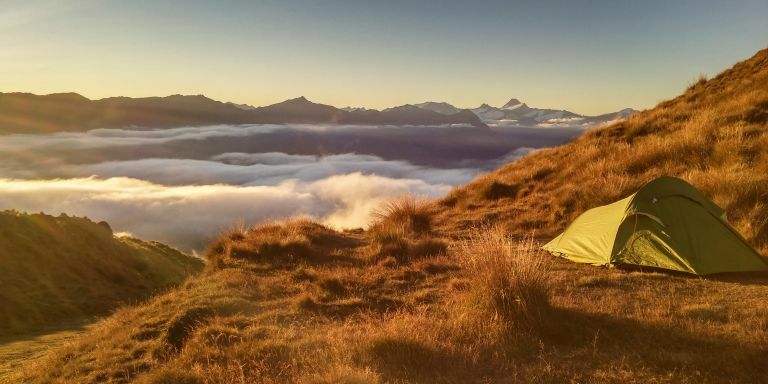 There are lots of compromises to be made when hitting the road, but finding the best backpacking tent needn’t be one of them. You want a tent that’ll protect you from the elements and fit everyone in your party, but also take up the minimum of space in your pack and not weigh you down while you’re walking? You got it. We’ve listed each tent’s hydrostatic head, a scary-sounding but pretty straightforward metric for assessing your shelter’s suitability in wet weather. It’s basically a measure of water-resistance: for example, a hydrostatic head of 5000mm means that the tent fabric can hold a column of water 5000mm tall before it starts to seep through. Everything else is fairly self-explanatory – choose the capacity depending on how many friends you’re dragging along, and the weight depending on how strong you’re feeling. Prepare for all eventualities with this semi-geodesic tent from OEX. Its marsupial-inspired name says a little something about its adaptability in hostile environments, and it combines ease, comfortable carry and toughness to win the day as our best tent for backpacking. Despite its impressive lack of weight, it packs in a roomy porch and strong aluminium poles in a sturdy configuration to stand firm in stormy weather, as well as having a pre-attached groundsheet for quick and easy pitching in poor conditions. Despite the cheeky name, this MSR tent is all business. The hub pole design cleverly maximises the usable space inside the tent, including head and elbow room, while ensuring it stays stable. The mesh canopy allows unrestricted views and, combined with the cross-ventilating flysheet, works to keep condensation at bay and allow optimum airflow, ideal for use on hot and sticky nights. The rain gutters make a nice feature in unexpected wet weather, although with the joint-lowest hydrostatic head on our list, it’s worth bearing in mind that this tent is better suited to dry weather. Easily our lightest two-person tent, this offering from Mountain Hardwear looks to be a great pick for the backpacking twosome. The truly freestanding design is a triumph of geometry, not sacrificing stability or coverage for the sake of being lighter to carry, and it has a number of handy features that bely its complete lack of heft – the welded zipper flap is drier than the usual sewn flap, and its guaranteed watertight construction makes it great at coping in wet weather; there are mesh pockets for interior storage, and a dry vestibule for storage and muddy boots. An all-seasons tent that’s compact and light enough to take backpacking? That’s right. This geodesic tent by Vango is specially designed for camping in winter and any adverse weather conditions, making for a harmonious meeting between advanced waterproofing and stability, and a packable, portable weight. It’s said to sleep three comfortably, and the ability to split doors, plus two separate entrances, keeps you from getting in each other’s way. Reviewers were very impressed, saying that they’d used this tent in extremes of weather and had no shifting or condensation for their troubles, meaning it really stands up to its built-like-a-tank promise. That this trekking tent features on the DofE recommended kit list is already high praise, and Vango back it up with their claim that the Banshee is ideal for beginners as well as more seasoned outdoorsmen. It certainly seems that way: comparatively inexpensive, lightweight (of course) and with an intuitive tunnel design that makes for quick and easy pitching, it’s a good entry-level option for striders of all stripes. The two doors and single porch mean the three inhabitants aren’t stepping all over each other, too. Lone wolves need look no further for the best one-man tent for their backpacking adventures. This one from Terra Nova looks simple, sure, but it squeeze in a surprising amount of functionality to suit three-season travel without overcomplicating things. The flysheet and inner can be pitched as one and, according to Terra Nova, in under five minutes; the strong but featherlight end poles are small to maximise space; it’s incredibly compact when broken down, and most importantly, outdoorsy reviewers found it stood up to strong winds and driving rain. This two-man tent comes highly recommended by reviewers as a beginner or budget option, but that’s not code for ‘a bit rubbish’, far from it in fact. Wild campers rated it for use even in storms and driving rain, and found it stood up well to elemental punishment, as well as offering a spacious sleep for two people and their essentials. Too long for most compact tents? Some jolly tall testers, including those who’d previously tried the Vango Banshee, found they didn’t touch the ends of this tent, so don’t lose hope in lightweight tents just yet!